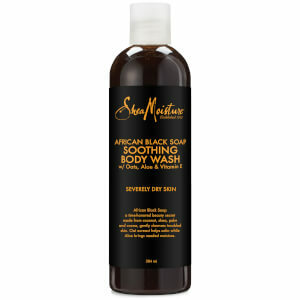 Refresh and revitalise from top to toe with the Shea Moisture African Water Mint & Ginger Detox Body Wash. The nourishing bath soak expertly melts away dirt and impurities with Activated Charcoal whilst using Shea Butter to replenish essential hydration for a silky-soft feel. After use, skin appears brighter, more balanced and visibly healthy, while the Mint and Ginger fragrance uplifts the senses. Apply to washcloth or hands, lather, and cleanse entire body. Or add a capful to warm water to create a spa bath. Water (Aqua), Decyl Glucoside, Sodium Lauroyl Lactylate, Cocamidopropyl Betaine, Caprylyl Glycol, Fragrance (Parfum), Xanthan Gum, Glycerin (Vegetable), Caprylhydroxamic Acid, Menthol, Butyrospermum Parkii (Shea) Butter, Charcoal Powder, Mentha Piperita (Peppermint) Leaf Extract, Zinc PCA, Zingiber Officinale (Ginger) Extract, Mentha Aquatica Leaf Extract, Opuntia Tuna Fruit Extract, Calendula Officinalis (Calendula) Flower Extract, Limonene. Natural ingredients may vary in colour and consistency. This packaging contains a minimum of 25% post-consumer resin.